There was much to celebrate in Fiscal Year 2016 (FY16). During the 25th anniversary year of Metro Rail, we continued our ambitious transportation revolution by opening two rail lines: the Gold Line extension to Azusa and the Expo Line extension to Santa Monica. The addition of new service brings the Metro Rail system to more than 100 miles, all of which was built in just 25 years. In FY16, Metro broke ground on many more projects, such as the Southwestern Yard, a maintenance facility that will serve to keep the future Crenshaw/LAX light rail line in a state of good repair. We lowered a 950-ton tunnel boring machine into the ground to begin digging twin subway tunnels for Crenshaw/ LAX. In partnership with Caltrans, we continued work on important highway improvements, particularly on the trafficclogged 5 Freeway. Meanwhile, we provided almost 450 million rides to Los Angeles County residents and visitors on 2,200 clean-air CNG buses and the expanding Metro Rail system. The year ahead will be every bit as exciting as we continue our efforts to improve traffic and deliver more mobility options to all parts of Los Angeles County for today, for tomorrow and into the future. Our growth continues with construction of one of the largest public works programs in the nation, including the Crenshaw/LAX Line connecting the Expo Line and the Green Line with a direct connection to LAX, the Regional Connector that will link light rail lines in downtown Los Angeles and the Purple Line subway that is finally headed west toward Beverly Hills and Westwood. As custodians of taxpayer dollars, we pledge to be frugal, responsible, practical and accountable as we invest in the future of Los Angeles County. Even as we continue to grow, we are carefully monitoring our resources. Over the past year we continued to emphasize the importance of tightened financial controls with new tools, such as increased performance monitoring, annual project evaluations, and both mid-year and year-end budget assessments. To complement and strengthen our transit network, we have an aggressive program to create a more walkable and bikeable environment. In FY17, we are launching Metro’s Bike Share pilot program with more than a thousand bikes at more than 65 bike share stations throughout downtown Los Angeles. We also have an agreement with the car sharing network Zipcar to provide vehicles for hourly or daily reservations at 10 Metro Park & Ride locations. These programs are just two of the many 5 first-last mile connectivity efforts underway to make it easier for our patrons to reach Metro stations and stops. In fact, more than $28 million is dedicated to first-last mile initiatives, active transportation and bike programs in FY17. For FY17, our number one budget priority remains providing excellent, safe, clean and on-time transit service to the public. Accordingly, we have established a thorough asset management plan to keep our buses and trains, along with other facets of our infrastructure, in top form. To that end, we are accepting delivery of the last of 900 new CNG buses to update our fleet and improve comfort and safety for our patrons. In FY16, we opened Division 13, a new state-of-the-art bus maintenance and operations facility that will enhance our ability to service vehicles for lines originating in downtown Los Angeles. We are currently in the process of buying new light rail vehicles to support our expanding rail system, as well as continuing efforts to upgrade the Blue Line, our oldest rail line and one of the busiest light rail lines in the United States. As we upgrade our bus and rail fleets and maintenance facilities, we are also experimenting with new methods – like all-door boarding – for improving the on-time performance of our traffic-mired buses. Among our safety and security goals is the achievement of an improvement in law enforcement response time to requests for help from customers and staff. We are also working to develop and launch more technology tools so our patrons can reach us when they need us. We recently rolled out cell service into our subways, which will facilitate open lines of communication, even underground. The Los Angeles county Metropolitan Transportation Authority, branded as “Metro,” adopted a $5.6 billion balanced budget for Fiscal Year 2017 (FY17). Metro’s FY17 budget includes a full year of operation for two new rail lines, the Gold Line Foothill extension to Azusa and the Expo Line extension to Santa Monica, which opened to the public in March and May 2016, respectively. These two new Measure R rail extensions have significantly enhanced our transit network by connecting our mountains with our beach communities and increasing the total miles of Metro Rail service to more than 100 in Los Angeles County. Metro Rail expansion continues in FY17 with three major rail lines in construction: the Regional Connector, Crenshaw/ LAX and the Westside Purple Line extension to La Cienega. As we continue to expand transit services and enhance service quality, projections show that we will face financial challenges. To mitigate future budget shortfalls, we are taking small steps now in order to avoid drastic measures in the future. Even with the addition of new rail services, rising costs and various new projects and programs, the FY17 budget represents a three percent decrease from the FY16 budget, proving Metro is resolute in controlling costs. As we continue to expand our transit system, Metro is in the midst of multiple efforts to increase fiscal discipline and accountability throughout the agency. A zero-based budgeting technique was used for FY17, requiring all departments to justify every expense from the ground up. Every single project included in the FY17 budget has been reassessed with an emphasis on deliverables in an effort to increase efficiency while spending taxpayer dollars as responsibly as possible. In January 2016, the Risk Allocation Matrix (RAM) was approved and the Internal Savings Account was established by an action of the Metro Board of Directors. These two new tools work in tandem: RAM is an ongoing agencywide collaborative process to identify a strategic mix of cost saving and revenue generating new initiatives, while the Internal Savings Account will capture new savings and revenues realized as a result of the RAM process and ensure prudent use of these monies. Ensuring financial stability is an ongoing agencywide responsibility, and each department will continue to identify new and innovative ways to increase revenues and decrease expenses in FY17 and beyond.To that end, we are continuously striving toward developing a diverse workforce and working to ensure compliance with civil rights and environmental justice requirements. We are also continuing efforts to sustain our environment, as well as collaborating with all our stakeholders to foster open lines of communication and increased transparency. In FY16, we introduced a new process to true up actual expenses to budget projections at both mid-year and year end. These new strategies complement the RAM process and will continue to generate additional deposits to the Internal Savings Account. We also developed new Key Performance Indicators (KPIs) to help monitor and assess departmental performance. The status of the KPIs will be reported on a quarterly basis along with monitoring of the achievement of RAM savings or revenues. In addition to overall performance monitoring, a new effort for regular assessment of existing projects will be launched in FY17, upon which the status and accomplishments of every program will be evaluated annually. By finding new ways to trim costs and generate revenues, holding each department accountable for performance measures and closely monitoring budget-to-actual variances, we are essentially reassessing the way Metro operates. With every efficiency improvement, we continue working toward a more secure financial future. Thanks to the completion of major projects, as well as agencywide efforts to control costs, the FY17 adopted budget represents a 3% decrease from the prior year. Through zero-based budgeting, RAM and cost control, we have absorbed cost inflation greater than CPI and achieved a $176 million savings from the prior year. As we continue to invest in Los Angeles County’s transportation infrastructure, we must also keep our focus on exercising prudent control over our finances. Capital expenses decreased from 40% in FY16 to a projected 38% in FY17, primarily due to the completion of construction on the Gold Line Foothill extension to Azusa and the Expo Line extension to Santa Monica. Operations expenses have increased from 26% in FY16 to a projected 28% in FY17, primarily due to the opening of the new Metro Rail extensions. As our transit network grows , it is important to remember that Metro is more than just buses and trains. We are also working toward improving available options for first-last mile connections to improve accessibility to the transit system and cultivate a more walkable and bikeable environment. Additionally, Metro works to improve highways, which our sprawling region relies heavily on as part of an integrated and multifaceted transportation network. As the regional transportation planning agency for Los Angeles County, Metro allocates transit funds to Metrolink, Access Services and all of the municipal transit operators. In addition, a portion of sales taxes collected is provided to the county’s 88 cities and unincorporated areas, allowing local governments to provide and maintain the building blocks of transportation at the local level. With all modes and all jurisdictions combined, we clearly are making strides toward achieving our goal of building the best, most innovative, balanced and customer-focused transportation system in the world. The State of Good Repair (SGR) program continues to be a top priority within the FY17 capital plan. This year, SGR efforts will focus on a wide array of asset improvement and maintenance projects, including bus and rail system reliability improvements and technology improvements. We are also concluding our recent acquisition of new 40-foot buses while completing bus midlife maintenance and engine replacements. In FY17, we will initiate new light rail and heavy rail vehicle acquisitions in addition to conducting component and midlife overhauls. As we improve the assets of our bus and rail system, we will also place an emphasis on infrastructure improvements. Union Station renovations for Fire and Life Safety improvements and ADA requirements are underway, while various improvements will be made to the Metro Headquarters building. While we work to expand our transit network, it is of utmost importance that we focus more than ever on maintenance of our assets in order to ensure that the system we are building operates in top form. In FY17, the number one budget priority related to transit service is to provide safe, clean and on-time buses and trains to the public. We are also focusing resources on inspecting, cleaning and maintaining our vehicle fleets and our transit stations to ensure our assets meet Metro and industry standards. New light rail vehicles are being procured to support the operation of our expanded Metro Rail system, and the final 75 buses to complete the 900 40-foot CNG bus buy are being purchased and delivered. With the completion of this most recent bus procurement, one third of the Metro bus fleet is now three years old or newer. The end of FY16 marked the highly anticipated openings of the Gold Line Foothill extension to Azusa and the Expo Line extension to Santa Monica. These new extensions connect our mountains and beach communities and offer a relaxing and money-saving alternative to driving on the busy I-210 and I-10 Freeways. The Gold Line now extends east from Pasadena to Azusa, with six new stations serving five cities and countless destinations in the San Gabriel Valley. The completion of the Expo Line has extended Metro Rail service west from Culver City to the coast, providing an opportunity for rail travel to Santa Monica for the first time in more than six decades. Together, the Gold Line and Expo Line extensions added 13 new rail stations and expanded the Metro Rail system by 20%. To improve system infrastructure and ensure smooth operation of our expanded Gold Line and Expo Line, two new operating and maintenance facilities were opened concurrently with the extensions: the Monrovia Division and the Santa Monica Division. We continue to launch new programs designed to improve on-time performance and the rider experience. The FY16 all-door boarding (ADB) pilot program reduced dwell time by 30-60% by allowing rear door boarding. Due to these favorable results, the ADB program is now being extended to the Silver Line in FY17. This expansion of the ADB effort will enable increased data collection and more accurate measurement of the impact ADB has on transit service. As we continue to test new approaches to increasing efficiency, we are improving the customer while simultaneously working to reduce operating expenses. Various efforts are currently underway to increase the flow of transportation information from Metro to the residents of Los Angeles County. As in prior years, Community Relations works to build support and enhance awareness of Metro’s services, programs and initiatives with cities, businesses and community leaders. Through these outreach efforts to coordinate activities with key stakeholders, we are maximizing the impact of Metro’s relationship with the community. To provide information to potential riders in close proximity to our transit system, safety awareness training continues at K-12 schools, organizations and institutions within a mile and a half of Metro Rail lines. To reach an even wider audience, new programs are also being tested. A pilot Metro Mobile Customer Center is being launched at the start of FY17 as a new resource of transportation information for residents of underserved areas. The pilot program is designed to give transit customers in areas without access to a Metro Customer Center the ability to purchase TAP fare media, submit reduced fare applications and obtain transportation information. For the pilot period, visits will be focused on senior centers, schools and special community events. During FY16, Metro created a database of nearly two million likely or potential transit riders through social media partnerships. This database creates unprecedented opportunities to communicate with our riders and the public. In FY17, we will continue to develop advanced targeting capabilities to promote ridership, concentrating on those who live and work within a half mile of transit stations or stops. Using innovative ad targeting and delivery platforms, we expect to see a significant increase in the success of these campaigns, which will result in an increase in ridership and an improved ability to reach Metro customers. In FY16, additional innovations are planned to enhance fare payment options. Improvements include development of a new mobile phone application that will allow users to manage their TAP accounts, register cards, enjoy payment options and purchase a variety of fare products – all from their mobile device. In addition, a new state-of-the-art website and new customer relationship management system will also be introduced as another way to make fare payment more convenient for our customers. Since 2009, Metro transit data has been available on Google Maps, allowing customers to plan custom trips using Metro buses and trains. Last year, Metro expanded its digital reach through additional partnerships with technology companies such as Apple and Waze. Through these agreements, transit Metro Gold Line & Station Subject to Change 17-0374 © 2016 LACMTA data has become available to an estimated 700 million iPhone and iPad users worldwide, with road and construction information now available to an estimated one million Waze customers in the Los Angeles area. These partnerships bring instant travel information to millions of customers, increasing the flow of transportation data and positioning Metro as a leader in public/private partnerships. With the completion of the Expo Line and Gold Line extensions in FY16, it is clear that we are making significant progress on the promises of Measure R. At this point, it is important to continue planning for the future. In FY17, the Planning department will lead the development of the 2017 Long Range Transportation Plan (LRTP) for Board adoption. This effort requires extensive coordination with all Metro departments, partner agencies, stakeholders and community members, and the final LRTP will align the agency’s capital investment program with adopted board policies. Once the LRTP is formally adopted by the Board, it will act as the governing document for the future of Metro and transportation in the Los Angeles County region. As transportation needs change, so does our transit service. In March 2016, a “Metro Line to Goal Line” task force was created to plan for new transportation needs resulting from the National Football League (NFL) team expected in Los Angeles County later this year. This task force is charged with identifying and addressing the transportation issues and opportunities associated with the imminent arrival of an NFL team, which is expected to dramatically increase transit demand around the football stadium. By planning carefully now, we aim to ensure that Los Angeles County’s adjustment to hosting an NFL team will be a smooth one. Furthermore, the enhancements to transit service that will be necessary to accommodate a new professional sports team will benefit all transit riders in the area, improving service for football fans and residents alike. The task force is made up of internal and external partners and is investigating a wide array of transportation issues surrounding the introduction of an NFL team to our region. Topics include a transit operations service plan, increased security and police presence, marketing of transit as a transportation option, joint development and first-last mile opportunities for completing trips to the stadium. Metro continues construction of one of the largest public works programs in America thanks to the voter approved Measure R sales tax along with other funding partners. A list of transit and highway projects active in FY16 is shown below, and a comprehensive list of Measure R funded projects and programs can be found on the following page. These projects will improve our transit system and increase vehicle capacity on our highways, allowing for better system connectivity, smoother traffic flow and more seamless travel throughout the region. In FY17, we continue our commitment to keeping our system in top form by dedicating $253 million to State of Good Repair (SGR), which is an element of the operating capital program. To ensure our system is safe and reliable, we must emphasize SGR as a major regional transportation priority that is just as important as building transit projects and providing transit service. As we take a proactive approach to continuously maintaining our assets, we are directly improving our ability to deliver more passengers on time without interruptions. SGR capital improvements for FY17 include completion of delivery on the last of the 900 40-foot CNG buses procured in earlier fiscal years. Procurement will begin for new 40-foot and articulated bus acquisitions, while bus midlife and engine replacements will restore our older vehicles. Similar projects will be undertaken for our rail lines, with contract awards anticipated for new heavy rail vehicles and heavy rail vehicle overhauls, as well as continued delivery of new light rail vehicles and progress on light rail vehicle overhauls. Metro defines operating capital as an investment for the repair, rehabilitation and replacement required to maintain reliable, safe, effective and efficient transit service. An operating capital program that achieves this vision requires enhancing and improving the transit system with up-to-date safety features and technological improvements that address security concerns in today’s environment. This year, the majority of rail safety and security capital improvements are planned for the oldest Metro Rail line, with $19 million budgeted for improvements on the Blue Line. Infrastructure upgrades are being made to enhance pedestrian safety at grade crossings, and the signal system continues to be rehabilitated on both the Blue Line and the Green Line to ensure that trains can travel safely on our expanding rail system. Construction of the Red Line Universal City pedestrian bridge is expected to be completed in FY17, and work will continue on the Red Line to Orange Line pedestrian underpass at North Hollywood Station. These projects will improve safety by eliminating the necessity of crossing vehicular traffic when traveling to or between these stations on foot. Finally, to enhance systemwide safety and security, improvements to the Emergency Operations Center will continue through FY17, as will security upgrades to the Universal Fare System. Active transportation refers to human-powered methods of travel, such as bicycling, walking, skating or using a wheelchair to get from one place to another. Everyone uses active transportation at some point in a trip, whether walking to a rail station, bicycling to work or rolling home from a bus stop. In FY17, Metro continues work on a number of projects and programs to advance active transportation and provide more travel options throughout Los Angeles County. In July 2016, Metro Bike Share will launch in downtown Los Angeles with up to 65 stations and 1,000 bicycles. This form of active transportation is designed to serve as a new first-last mile solution for connecting users with transit in the downtown area. Payment for Metro Bike Share is fully integrated with the bus and rail system: the program utilizes TAP fare payment and will be the first bike share program in North America that was planned as an extension of transit. As we launch Metro Bike Share downtown, we are also working with other communities to expand the system in the next few years to areas such as Pasadena, Huntington Park, Glendale, Burbank, North Hollywood, East Los Angeles, Exposition Park, the San Gabriel Valley and others. Work continues on the LA River Gap Closure Project, which will close the gap in the LA River Bike Path between Elysian Valley and Vernon. Once the project is complete, there will be a continuous 32-mile bikeway along the river running from the San Fernando Valley in the north to Long Beach in the south. 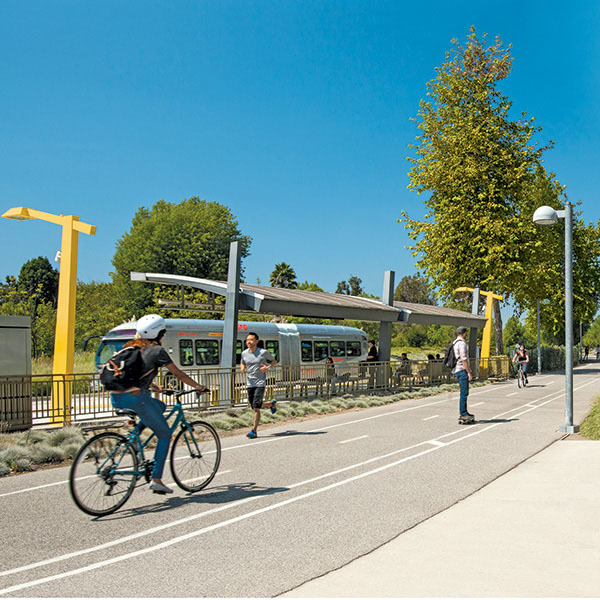 Similarly, the Rail to Rail/River Active Transportation Corridor (ATC) will provide the communities of south and southeast Los Angeles with a dedicated bicycle and pedestrian corridor. The ATC will improve multimodal connectivity at three regionally significant north-south transit lines: the future Crenshaw/LAX Line, the Silver Line bus and the Blue Line, with future connection to the LA River. Together, these efforts will create a backbone for a new active transportation infrastructure while simultaneously enhancing mobility, providing increased commute options and improving the overall quality of life for the local communities surrounding the projects. Last year, Metro launched the Transit Oriented Communities Demonstration Program to showcase a comprehensive 25 approach to building communities that support transit. Under the program, Metro partnered with other government agencies to develop a Transit Oriented Communities Loan Fund that will support affordable housing and small businesses along transit corridors. We also adopted a formal policy on affordable housing. The new policy encourages the construction of more affordable housing in transit oriented communities by establishing a goal that 35% of residential units built on Metro owned land be affordable to households at or below 60% of the median income for the area. Joint development efforts continue in FY17 with the commencement of community engagement for the El Monte Station, Vermont/Santa Monica Station and Division 6 joint development sites. Four Request for Proposals (RFPs) will be released to solicit new ideas for two sites along the Crenshaw/ LAX corridor and two in Boyle Heights along the Gold Line Eastside extension. Developer selections will be brought to the Board before the end of the fiscal year. There is growing interest by our federal and state partners in the Los Angeles County ports as a crucial import and export site. Together, the Ports of Los Angeles and Long Beach make up the largest seaport in the United States, facilitating more than 14 million containers per year. Accordingly, goods movement is a major area of focus for the agency this year as Metro works to coordinate goods movement policy and funding in Los Angeles County and surrounding regions. These efforts will ensure that a plan is in place to alleviate congestion on high traffic goods movement corridors, enabling Los Angeles County to continue to thrive as the country’s main port for international trade. Through providing mobility options and choices, Metro plays an active part in lowering greenhouse gas emissions and increasing both physical and economic health in our local communities. In January 2016, the Metro Board adopted the Urban Greening Implementation Action Plan, which includes tools for developing projects that improve transit access and sustainability of areas around stations. The website for the program showcases a user-friendly toolkit that provides placemaking and greening resources for local jurisdictions and community groups spearheading projects around transit locations, making Metro a key player in sustainable planning and design throughout the entire region. Metro’s parking program, which provides parking for approximately four million cars annually, implemented a new parking ordinance in FY16. The ordinance establishes guidelines that govern the management of Metro’s 87 parking facilities, which serve 59 transit stations with approximately 25,000 total parking spaces. In FY17, a parking guidance system will be implemented at targeted high-use facilities to provide real-time parking availability information to our customers. Meanwhile, a parking management pilot program will be launched in order to manage demand through parking fees and permits. To explicitly lay out future enhancements, parking program staff will finalize the Supportive Transit Parking Program Master Plan and bring it to the Board for adoption this year. As we work to improve the management of available parking, we are striving to make it easier and more convenient for drivers to choose transit over their cars. Sales tax and TDA revenues are expected to grow at 3.3% over the FY16 budget. This represents a growth consistent with actual and projected receipts for FY16 and is in line with nationally recognized economic forecasting sources. Fare revenues will increase by 1.8% over the FY16 budget reflecting a full year of operations of the Gold Line Foothill extension to Azusa and the Expo Line extension to Santa Monica. State Transit Assistance (STA) revenues for bus and rail operations and capital in FY17 are expected to be $52.9 million regionwide, representing a 50.0% decrease from the FY16 budget due to continued statewide decline in diesel fuel prices and demand. Grant reimbursements, Transportation Infrastructure Finance and Innovation Act (TIFIA) loan drawdowns and sales tax carryover will total $2.3 billion in FY17, which is in line with planned expenditure activities. Cap and Trade funding for Metro totals $13 million and Federal CNG fuel credits of $18 million are expected to fund operations. ExpressLanes toll revenues are expected to come in at $60.0 million in FY17, which equates to a 3.5% decrease from the FY16 budget based on actuals year to date. Advertising revenues of $25.1 million are based on a fixed guaranteed amount. The FY17 budget assumes a slight 0.8% decrease in bus revenue service hours, primarily due to increased speed and optimization of service levels. This also includes implementation of Line 501 (North Hollywood to Pasadena Express) for a full year and other anticipated special event coverage and bus bridges. Rail revenue service hours will increase by 15.4%, reflecting a full year of operations of the Gold Line Foothill extension to Azusa and the Expo Line extension to Santa Monica. Budgeted headways will match current actual headways for night service, and weekend mid-day/PM headways on Gold Line will align with other rail lines. The budget reflects negotiated wage and salary provisions for represented employees. The wage increase by these provisions is at least 3% for annual wage increases and an additional amount for step increases up to the maximum pay rate. In line with these negotiated wage rates, an average 3% merit increase is also included for non-represented employees. Health and welfare rates include an annualized average increase of approximately 10% for represented employees and 5% for non-represented employees. Capital program assumptions include expansion of Measure R transit and highway activities, increased emphasis on safety and security projects and enhanced bus and rail vehicle midlife maintenance projects. (1) Sales tax and TDA revenues for FY16 Budget represent reforecasted levels based on 2nd Quarter information from the State Board of Equalization (SBE). (2) Includes bike program revenues, park and ride revenues, lease revenues, vending revenues, film revenues, county buy down, auto registration fees, transit court fees, CNG credits, investment income and other miscellaneous revenues. (3) Includes grant reimbursement of preventative maintenance, operating capital, highway capital and construction costs. (4) Represents use of bond proceeds, TIFIA (Transportation Infrastructure Finance and Innovation Act) drawdowns and sales tax revenue received and unspent in prior years. (1) Sales tax and TDA revenues for FY16 Budget represent reforecasted levels based on FY16 2nd Quarter actual data from the State Board of Equalization (SBE). (2) Measure R Rail 5% Operating funding is restricted to projects beginning rail operations after Measure R passage. (1) Combines related program costs regardless of Generally Accepted Accounting Principles (GAAP) reporting criteria used for fund financial statements on pages 34-35 and 44-45. (2) Represents subsidies to Municipal Operators, Metrolink and Access Services. (3) FY16 budget represents all amendments that occurred after budget adoption in May 2015. Metro’s congestion Management programs are designed to tackle the ever present issue of traffic congestion in the region, whether by assisting broken down vehicles, clearing traffic accidents, promoting ridesharing or providing toll-based alternatives to waiting in traffic. Metro also sponsors the Regional Integration of Intelligent Transportation Systems (RIITS), a real-time traffic data monitoring network used by emergency services, transit agencies and thirdparty users throughout Southern California. Each of these measures contributes to decreasing traffic congestion, which in turn improves air quality in Los Angeles County. The Metro Freeway Service Patrol (FSP) is a team of tow truck drivers that provides assistance to stranded motorists and clears traffic accidents on freeways in Los Angeles County. FSP services are free of charge and include changing flat tires, jump-starting dead car batteries, refilling radiators, providing temporary fixes to leaking hoses, providing one gallon of fuel and towing of cars that will not start. The FSP helps reduce traffic congestion in Los Angeles County by repairing or removing disabled automobiles and clearing traffic accidents off the freeways. This reduces the likelihood of further accidents caused by onlookers and impatient drivers. Metro ExpressLanes is a program designed to improve traffic flow and provide enhanced travel options on the I-10 and I-110 freeways in Los Angeles County. By introducing congestion pricing, the program provides a faster transportation option to motorists. Tolls on the ExpressLanes are calculated based on the level of traffic congestion and trip length in the ExpressLanes. Tolls are higher when there is more traffic in the lanes, and vice-versa. The Kenneth Hahn Call Box Program is a system of call boxes along Los Angeles County freeways intended for use by motorists in need of assistance or reporting emergencies. The system comprises more than 4,400 call boxes and generates more than 20,000 calls per month to the California Highway Patrol. As cell phone use increases, usage of the call boxes in Los Angeles County has declined. Because of this, the call box system has been restructured from the primary means of contacting roadside assistance to a secondary “safety-net” system. The call box system has been upgraded from an analog system to a fully digital system. The Regional Integration of Intelligent Transportation Systems (RIITS) network is a Metro-sponsored multimodal planning and operations tool for public agencies in the five counties of Southern California. The network supports real-time information exchange between freeway, traffic, transit and emergency service agencies to improve the Los Angeles County transportation system. RIITS can be used to view real-time freeway and major arterial traffic congestion data, freeway cameras, travel time estimates, and to assess current conditions of the transportation system in Southern California. Metro administers its Vanpool program to provide commuters with an alternative means of transportation to drive alone. Similar to a carpool, a vanpool is a group of 5 to 15 people who travel to work together in a van. Commuters using vanpools save money due to the high cost of driving alone. Commuters can create vanpool groups or join existing groups with valid leasing agency agreements. Metro provides up to a $400 monthly lease subsidy to eligible vanpool groups. By reducing the number of automobiles on the road, the vanpool program helps reduce traffic congestion, improve air quality and provide commuters more transportation options. Metro Rideshare provides resources to commuters looking for alternatives to driving alone, including ride matching and connecting them to subsidy programs. The Measure R sales tax revenue ordinance approved by voters in 2008 has rapidly become the single largest local funding source for the transit capital building boom currently underway in Los Angeles County. Metro’s management is focused on carefully using this funding to ensure that the transit capital and highway projects outlined in the ordinance become a reality. The investment in public transit and highway infrastructure made possible through Measure R and other funding partners has benefited the region not just in terms of improved mobility, but also with increased economic activity and job creation. This is no small feat considering the worldwide economic downturn at the time when Measure R was approved. Metrolink is the sole recipient of funding from the Measure R 3% component, which is eligible for operations, maintenance and expansion of the commuter rail system. These funds have helped finance various safety and system improvements, including the installation of the much needed positive train control system. Local jurisdictions in the county receive funding through the Local Return subfund, which is allocated based on population. As specified in the Measure R ordinance, these funds must be spent on transportation projects and infrastructure improvements such as major street resurfacing and rehabilitation, pothole repair, left turn signals, bikeways, pedestrian improvements, signal synchronization and transit. In addition, the Bus Operations subfund is allocated to Metro and other transit providers in the region based on the Formula Allocation Procedure in order to fund countywide bus service operations, maintenance and expansion. Metro is the Transportation Planning Agency for Los Angeles County. In this capacity, Metro plans, programs and administers various local, state and federal funds for the operating and capital needs of the county’s transit systems and various transportation improvement programs. In FY17, $1.3 billion in subsidies is going right back into Los Angeles County. Funds received by municipal transit operators, Access Services and Metrolink are used by those agencies to provide transit services, ensuring mobility throughout the region. Funds received by the 88 cities and unincorporated areas of Los Angeles County are used to invest in transportation improvements at the local level, such as public transit, streets and roads, bikeways and pedestrian improvements in their areas. Access Services (Access) fulfills the provision of the Americans With Disabilities Act of 1990 (ADA) mandated complementary paratransit services on behalf of Metro and 45 other transit agencies in Los Angeles County. Access is predominantly funded with federal Regional Surface Transportation Program and Proposition C 40% Discretionary sales tax revenue funds allocated by Metro. As required by the ADA, Access is available to individuals who are determined to be ADA eligible for trips within Los Angeles County that originate and terminate within three quarters of a mile of a fixed route bus line or rail station. Access provides service during the same hours of operations as the fixed route bus operators in Los Angeles County. Access is a shared ride service that uses a combined fleet of small buses, mini-vans and taxis. In FY 16, Access provided more than 3.4 million trips to more than 175,000 qualified customers with disabilities in a service area of more than 1,950 square miles. Additionally, Access has a Free Fare Program that provides eligible Access customers with free boardings on most bus and rail systems within Los Angeles County. Metrolink is the commuter rail system operated by the Southern California Regional Rail Authority (SCRRA), a Joint Exercise of Powers Authority, on behalf of the transportation agencies in Los Angeles, Orange, Riverside, San Bernardino and Ventura counties – the member agencies. Spanning 534 route miles over seven lines with 59 stations, Metrolink expects to operate 171 weekday trains and 90 trains on weekends in FY17. Downtown’s Los Angeles Union Station represents the destination of over 67% of all Metrolink riders. In FY16, the Metrolink system became the first commuter rail agency in the nation to initiate the operation of a Positive Train Control system across all services and began new service on the Perris Valley extension of the Metro supported 91 Line to the Inland Empire. During FY17, Metrolink will begin receipt of its fleet of new Tier IV locomotives that, when fully deployed, will reduce emissions by up to 85% over the current flee. Member agency contributions to Metrolink represent the net subsidy requirements of operating the system over and above all system generated revenues such as fare and freight railroad reimbursements. As the agency’s largest partner, Metro provides approximately 51% of all Member Agency operating contributions to the SCRRA. Public Transportation Services Corporation (PTSC) is a nonprofit public benefit corporation. PTSC was created in December 1996 in order to transfer certain functions performed by Metro and the employees related to those functions to this new corporation. The PTSC conducts essential public transportation activities including: planning, programming funds for transportation projects within Los Angeles County, construction, providing certain business services to the County’s Service Authority for Freeway Emergencies (SAFE) and the Southern California Regional Rail Authority (SCRRA), and providing security services to the operation of the Metro bus and rail systems. PTSC allows the employees of the corporation to participate in the California Public Employees Retirement System (PERS). The Exposition Metro Line Construction Authority (Expo) was created by the State Legislature under Public Utilities Code Section 132600, et seq. for the purpose of awarding and overseeing final design and construction contracts for completion of the Los Angeles-Exposition Metro Light Rail project from the Metro Rail Station at 7th Street and Flower Street in the City of Los Angeles to downtown Santa Monica. SAFE receives its funding from a dedicated $1 surcharge assessed on each vehicle registered within Los Angeles County.